My niece Sofia is cut from the same cloth. When she lived with us in Brooklyn two summers ago, she didn’t blink as we stopped at the hidden taco counter at Reyes Deli in Sunset Park on our way to have a huge dinner at the glorious Mister Hotpot. At 19, she was as excited by eating those Al Pastor tacos, with their little bits of charred pineapple, with her old uncle as she was by the glamour of NYC nightlife. The summer was spent eating wonderful things together, drinking too much together and sharing with her all the things I loved about New York. When I heard that she was going to visit us in Tokyo on her way to a summer of teaching in the slums of Nepal, I was thrilled. Where others might have gloried in showing her old temples and museums, I grew excited imagining her first bite of the “Guts Stew” at Sancha Nomiba Marco. My schedule for her week-long visit was based around food and drink and everything else was ancillary. It was a wonderful visit. She ate ramen with my son on Kitamachi; we explored the markets of Ueno. I took her to my favorite fried chicken stand (which she managed to make her way back to numerous times during her stay). We ate oden served by an ancient woman, hands shaking as she handed us our order. In the shadow of Asakusa’s great shrines, we munched away at a pork and onion stuffed koroke. She fell in love with our neighborhood of Heiwadai and the tiny 4-stool standing bar tucked away in a narrow alley. She had gyoza, silky Ma Po tofu, fried shanghai buns, Japanese curry, yakiniku, sushi that was automatically delivered via a high-speed conveyor belt, stunningly good yakitori at a new place I have discovered; we even explored the red underwear shops on Old People Street in Sugamo and ate fried mackerel and “mince cutlets”. We went to Big Tiger’s, drank frosty mugs of beer and she had her name immortalized on the wall. She searched out the perfect, embroidered silk jacket in Harajuku. And yes, she purred in pleasure eating that transformative Marco stew of offal, yam and carrot. A place, a city, can never be yours until you make your own discoveries. And that we did, together. En route to a long day of walking and exploring downtown Tokyo, I mentioned a sandwich I had spied that looked of interest. It was being sold at a grubby shop located next to a Thai restaurant that is a favorite to the lunching moms of Heiwadai. Although it was early and we had eaten breakfast and were on our way to lunch, we decided to try it. I don’t know why the place sparked my curiosity, except to say, that I am blessed with good food radar. The place is beyond humble. 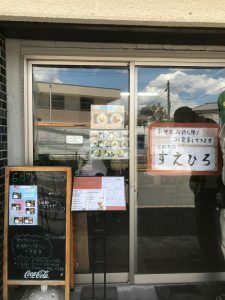 A low building with a simple glass door festooned with fly-specked, and not very appetizing, pictures of the offered lunchtime specials. What caught my eye was a singularly depressing image of a katsu sando (fried pork sandwich). My logic kind of went like this: with a photograph this bad, the sandwich itself must be extraordinary. We arrived just as they opened and ordered one sandwich to split. The interior had all the charm of a Riker’s Island holding cell, cinder-block walls and painted cement floor sticky with an unknown substance. Judging by the large amount of bento boxes they were preparing, it seemed the majority of their business was take-out. The owners were kind and jolly however and served us chilled barley tea while we waited. Derived from the European schnitzel, Tonkatsu has been eaten in Japan since the 19th century. It is a thick cut pork loin breaded with panko and deep-fried. It is typically served with shredded cabbage and dressed with bulldog sauce (a type of fruity, worcestershire sauce) and mayonnaise. It is served everywhere in Japan, in specialty restaurants, at home, in diners and often covered in Japanese curry for a savory-crunchy delight. 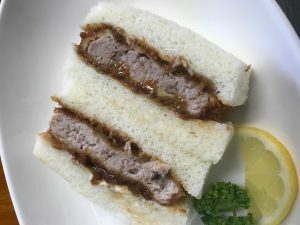 The katsu sando is a more simple beast: the room temperature loin is dressed with bulldog sauce and encased between two pieces of white bread. It is sold at bakeries, convenience stores and bento box purveyors. When our katsu sando was ready, it was cut into three pieces, placed into a plastic take-out container alongside a dollop of potato salad. We decided to act like barbarians and eat while we walked. It was better than I even hoped. The pork itself was fried to perfection. Still warm, the crust cracked against the teeth releasing deeply flavorful juices of the tender meat inside. The bulldog sauce was home-made, notes of plum and smoke dancing on the palate, counter-balancing the porcine richness of the meat. The pliable and bland white bread acted as the perfect binder, sopping up all the flavors and keeping the hands sauce-free. Sofia and I split the last piece, one bite each, both secretly resenting the other for that extra nibble. The day of her flight, she asked to go back so we could both have a whole sandwich to ourselves. Sticky floors and all, we happily made fast work of the Katsu Sando, which arrived sadly garnished with a curly leaf of parsley. It may have been ugly, but it was delicious. 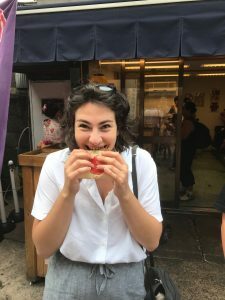 The sandwich will forever hold the memory of my lovely niece; and while she toils away doing wonderful deeds for the poverty-stricken children of Katmandu, I hope she recalls that delicious treat, feels a fondness for a Tokyo she discovered and knows that her Uncle loves her.